Isn't this inspiration photo so lovely??? I love pinks and blues together, whether they are pastels or BOLD! As you can see...I chose BOLD!!! 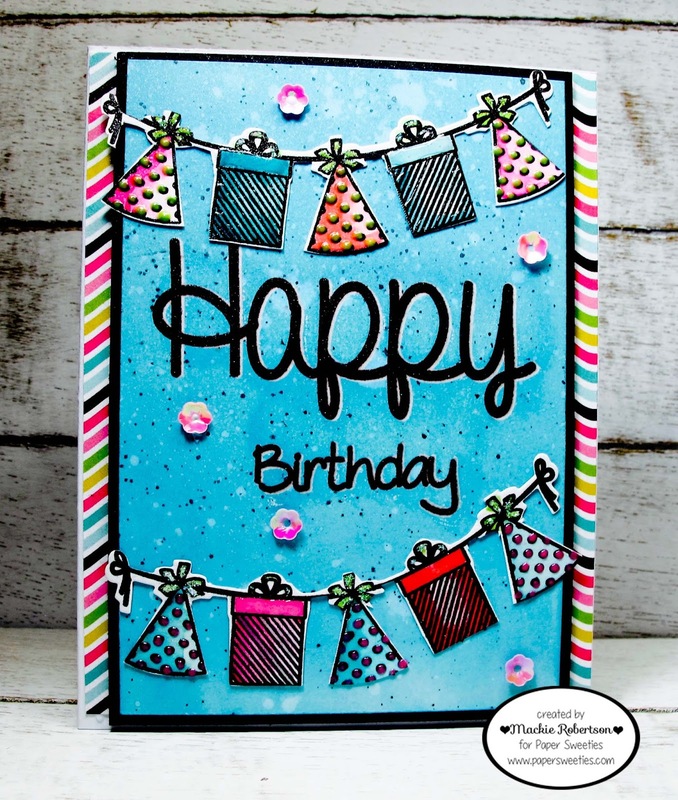 I started by stamping the BIRTHDAY BANNERS with Black Versa Fine ink and heat embossing with clear embossing powder. After coloring them with Zig markers, I die cut them with their matching BIRTHDAY BANNERS SWEET CUTS. Next, I worked on the background panel. I used a new technique to me called Shadow Resist Embossing. First, I stamped the word HAPPY with black ink using my Misti tool. (You will need to have the Misti tool for this technique to insure all of the stamping lines up perfectly) Before removing the stamp, I stamped again, using Versamark ink. Then you remove the stamp and replace it slightly below and to the right of the original stamped image, and stamp again with Versamark ink. Apply clear embossing powder and heat set. Then the fun begins!!! 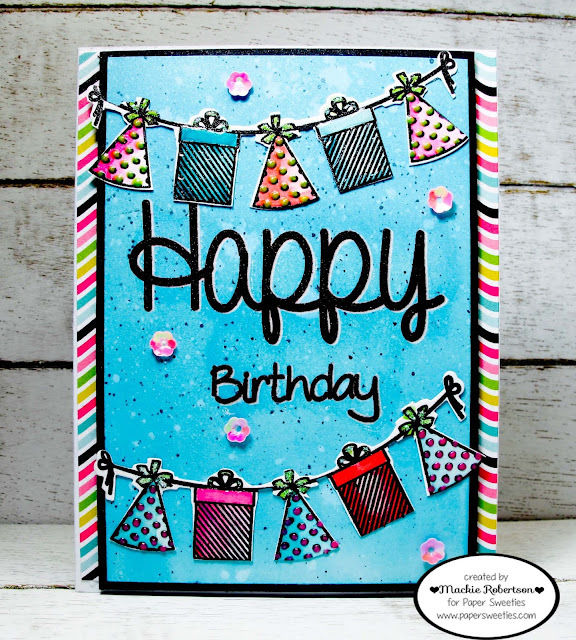 Choose a Distress or Distress Oxide ink of your choice and sponge the entire area around your stamped words. You will get this amazing shadow affect around your sentiment! My final steps were to add lots of texture to my finished product with Paper Sweetie Cotton Candy Sequins, Nuvo Crystal Drops, Glossy Accents, Stickles and a little bit of Glimmer Spray! 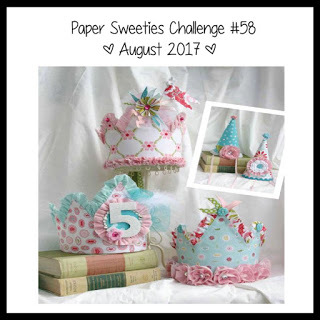 If you need more inspiration, go check out my amazing SWEETIE TEAMIES! Love love love love this! LOVING those banners!!!!!!!!!!!!!!!!!! 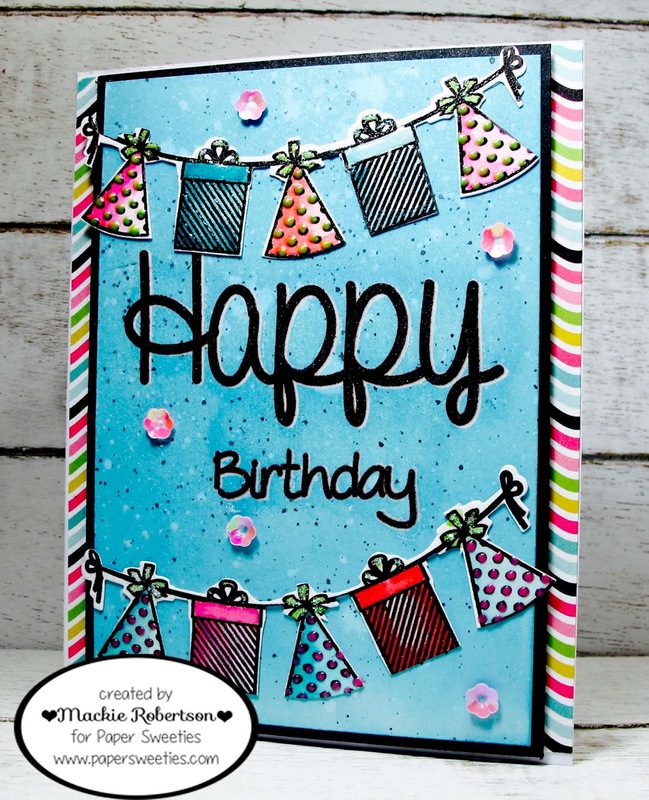 Gorgeous card, Mackie! I love that background - so pretty! Love the bright blue background and fun banners...great card!!! Oh how fun! Your banners are bright, happy and so festive! Terrific Mackie!! LOVE the BOLD background and the party banners! FAB card, Mackie!